Both these concertos have received a number of fine recordings, most of which are still in the current catalogue, so I guess the main lure for this new Hyperion disc is the fact that they are coupled together for the first time. I certainly found it a key point of interest, as they are such diverse bedfellows. The Vasks concerto is almost becoming a repertoire piece, mainly due to the championing of it by its dedicatee, Gidon Kremer, whose own recording is something of a benchmark. It is such a richly lyrical and atmospheric piece it could virtually be included in Hyperion�s �Romantic Violin Concerto� series. Modernist tendencies are generally kept at arm�s length and where they occur, such as the opening slithery harmonics from the soloist, they never rock the tonal boat. 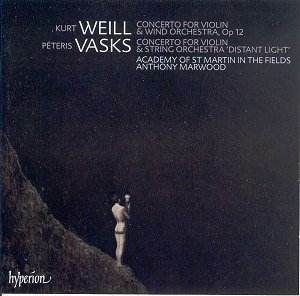 As Martin Anderson�s authoritative booklet note rightly says, ��one of the prevailing characteristics of Vasks� music is sheer beauty of sound� and goes on to observe that the opening sonority �places Vasks stylistically exactly where his geographical origins are � between Pärt and Lutosławski�. The fairly static overall harmonic movement tends to suggest the former, while I guess the shape of the melodic lines and odd use of clusters might summon up aspects of Lutosławski�s style, without ever being too dissonant or alienating. There is no doubt that this is an intoxicating piece, the rich bed of string orchestra textures always providing comfort is the face of some of the soloist�s melismatic experiments. Marwood�s performance, by turns wistful, soaring, virtuosic, is all one could hope for; I can�t imagine Kremer�s is any more convincing, and that�s high praise. What a perfect contrast this is to the spiky neo-classicism of the Weill, where the piquant dissonances of the wind band and opening side drum at once summon up echoes of Stravinsky�s Soldier�s Tale and Hindemith�s Kammermusik, though Anderson rightly points also to Weill�s teacher Busoni as another key influence. I suppose this sound-world was almost inevitable for a young composer working in 1920s central Europe, but Weill is his own man as well, never aping anyone. Indeed, the whiff of decadent cabaret is also present, with foreshadowings of his later work with Brecht. It�s inventive, rhythmically buoyant, occasionally a little academic and dry, perhaps easier to admire than love, but never less than interesting and quite substantial at nearly half an hour. Again, superbly responsive and agile playing from all concerned do the work�s cause nothing but good. It just remains to be said that the recording is excellent, so if you don�t know either piece and fancy the coupling, don�t hesitate.